Last month I reviewed Vital Theological Issues from this same series. These books are a good way to bring yourself up to date on current issues. 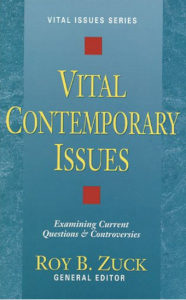 In section one, this volume deals with moral conflicts, abortion, homosexuality, euthanasia and AIDS. In section two, it deals with doctrinal issues such as Liberation Theology and the Signs and Wonders Movement. Thomas Edgar on the cessation of sign gifts is the best I have read in a while.